This page (and any other documents that are referred to on it) contains the Terms and Conditions on which we supply any of the products listed on our website www.shoepassion.co.uk (“our website”) to you. Please read these Terms and Conditions carefully before ordering any products from our website. You should be aware that by ordering any of our products, you agree to be bound by these Terms and Conditions. If you have any questions or feel unsure about any of the content please contact Customer Service at service@shoepassion.co.uk before placing an order. Print the Terms and keep a copy of them for your reference. Contract - means any purchase of items from our site between us and you for which these T&C’s are used for. Conditions - means the standard T&C’s of the sale, including the Returns Policy and any special terms and conditions confirmed in writing by us. We – means SHOEPASSION.com, and “us” and “our” shall hold the same meaning. SHOEPASSION.com is your online shop of choice for highest quality men shoes. Almost all of our shoes are manufactured applying one of the oldest assembly methods for footwear – Goodyear Welt. 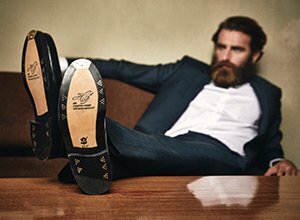 Altogether we have more than 380 different models of fine leather shoes and a huge range of equipment. If you need to contact us, please contact our UK Customer Service centre, by email at service@shoepassion.co.uk or by telephone at 0044 20 33182476. SHOEPASSION.com is available by phone between 8 am to 6 pm. When you place an order with us, you are making an offer to buy goods. After receipt of your order we will send you an order acknowledgment email detailing the products and prices you ordered. If you do not receive such an email within two working days of placing your order please contact our Customer Services. An automated email will be sent to you after you place your order. This email is not an acceptance of your order but merely shows that your order is being processed. Acceptance of your order and formation of the contract will only take place once we have confirmed your card authorisation for your order. We will send you a despatch confirmation email when the products you have ordered have left our warehouse. If your order has not been accepted you will receive an email from us telling you the reasons why. We only supply to households for personal use and as such will only sell what is deemed to be personal quantities. Contract conclusion is available in English. All prices shown in the website are in pounds sterling and inclusive of VAT at 19%. Where applicable, VAT may change from time to time. In case we use a special sale offer price please note that this might be a limited period offer, which we will then indicate. The price for goods remains the same regardless of the country of delivery. A charge of 3,95 GBP will be made to cover postage and packaging on all orders sent to single UK mainland or Channel Island addresses. Only if you would like to order a shoe-polishing machine, we will count you delivery charges of 19,95 GBP. The delivery charge is not included in the product prices shown. We also offer international delivery to a number of countries. All orders for international delivery are subject to international terms and conditions. We accept Direct Debit, Credit card or PayPal as methods of payment. We take payment from your card at the time we process your order ready for despatch. We have tried to make shopping with us as easy as possible, e.g. you can filter by type of product. If you would like to place an order, you can register as a customer with us. You will then be given a unique personal log-in name and password combination by email. Your personal details will be stored behind your log-in name and password and can only be accessed and changed by you. As soon as you have a log-in name and a password, you can place an order. You could select your products before you register, but before you can check out you will need to go through the registration process. When your order has been shipped we will send you a despatch confirmation by email. This will include a tracking ID. We send the goods that you have ordered through DHL. The place of delivery is deemed to be the shipping/delivery address that you provide in your order. For a number of products we offer an exclusive service - we will manufacture the article especially for you. Delivery time will be about 45-60 days. This time will always be stated on the product page. You have a legal right to cancel your contract before delivery and up to 30 days after delivery. To do this please e-mail us or write to us. We will refund your money and your original delivery costs within 14 days from when you request to return or cancel your order. You do not have to give any reason for cancellation. However a brief explanation will help us to improve the service we offer to customers in the future. If you would like to return any article, you will only have to pay the return shipping costs if the value of the item(s) you are returning is £40.00 or less. If the value of the item(s) you are returning is more than £40.00 and the return package is labeled with the return label we provided in the shipping confirmation, we will take on the return shipping costs. In case of an exchange, we will send you the new item with no additional charges. If you can no longer find your shipping confirmation e-mail, simply write to service@shoepassion.co.uk. We have a growing number of websites in specific countries from which you can order directly: see the language and currency element on our website for an overview of these. Payment from outside of the UK may be made by any of the methods indicated on our website. Payment shall be made in GBP. Please view our Payment Page. The exchange rate will be set by your bank or credit card provider who may also charge you an additional administration fee. We do our utmost to provide you with the best information, products and services possible. In the case you do have a complaint or other comment to make please contact us by telephone, email or post at the earliest possibility clearly explaining the feedback you have. We will reply within 4 days. This website’s content (including text, design, layout, images, and videos) are protected by copyright and are the property of SHOEPASSION.com. Any use other than for your own personal and non-commercial use in line with the transactions and communications between you and us is not allowed without our express written permission. These terms were last changed on 15 of November 2016. Previous versions of our standard Terms and Conditions can be here. We will not be liable or responsible for any failure to perform, or delay in performance of, any of our obligations under these Terms and Conditions that is caused by events outside our reasonable control which includes any strikes, civil commotion, terrorist attack or threat of terrorist attack, fire, explosion, flood, other natural disaster, impossibility of the use of public or private transport, impossibility of the use of public or private telecommunications networks or any acts, decrees, legislation, regulations or restrictions of any government.